Nothing is more important that good performance in academic work in school for our young student-athletes. Every practice, as children leave, and say goodbye, I say “Study hard, get smart, become an intellectual!”. Its done in a light-hearted way to remind them that after practice, that’s “what’s next” in their life, or should be. Now we’re closing in on the end of school year, with upcoming tests and related “due dates”. At the same time, we’re at the beginning of the long course season. The work we put in in the pool NOW, is paid off in July at various championships. Without consistency NOW, there is no payoff later on. For the 60 years that Age Group Swimming has existed, it has been proven for literally millions of swimmers that they can uphold their commitment to training AND study well and get good grades. Its an exception in swimming when a child does NOT get good grades. Partially because there is real URGENCY to study when you can when a few hours each afternoon are taken up in training. When swimmers are NOT training, they get the attitude of “oh, i have all this free time now..i can goof around for awhile and get to studying later”. That never works out very well. Everyday I ask children about their homework. Sometimes I hear, “I don’t have any.” My response is always the same “YES, YOU DO.” Get your books out and WORK AHEAD…even if you only comprehend 10-20% of what you are reading, that’s a 10-20% jump ahead rather than seeing/hearing it in class for the first time. When you’re in school, you ALWAYS have homework…open the book and “get ahead.” Study is like any other habit….do it 2 hours a night EVERY night, and you’ll avoid having to be up and working at 11 PM or later on some of those nights……steady, consistent work is the key, in school and in swimming. Homework EVERY DAY for all ages. Study Everyday. Swimming practice consistently as well. Studying ahead removes anxiety and keeps the student on the leading edge of the class, not the trailing edge. “Study Hard, Get Smart, Become an Intellectual!” DAILY. Lets be equally consistent with both practice attendance and daily study. It’s hard work…but it’s so much better than being unprepared, anxious and upset later. Parents, please share this with your children. Children are getting too much flattery and not enough moral instruction. Mike didn’t know it, but he was providing grist for his interlocutor’s next book. 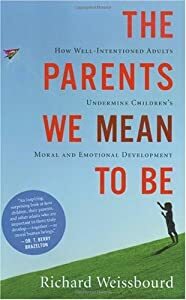 Richard Weissbourd, a psychologist at Harvard’s School of Education and the Kennedy School of Government, recounts the anecdote about Chris’s over solicitous stepfather in “The Parents We Mean to Be.” (“The Parents We Mean to Be,” By Richard Weissbourd, Houghton Mifflin Harcourt, 241 pages, $25) It is just one of many illustrative stories that Mr. Weissbourd has gathered over the past two decades. He and his assistants — including two high-school students, who presumably had good rapport with other teenagers — surveyed three Boston-area high schools, conducted focus groups, made “informal observations” of families in cities across the country, and interviewed sports coaches, teachers and mental-health professionals. What did Mr. Weissbourd’s research tell him? That nowadays “well-intentioned adults undermine children’s moral and emotional development.” Parents have abandoned the “moral task” of rearing children, he says, and are more concerned about fostering their happiness than their goodness. Therapeutic interaction takes precedence over moral instruction; intimacy is maintained at the cost of authority. Mr. Weissbourd is also dismayed by many parents who put subtle but unrelenting pressure on their children for academic and extracurricular achievement. He talks to a 16-year-old who says that his parents make an elaborate display of saying that his getting into a “high-status school” is not important to them, that they just want him to learn and be happy. “But then they pay for SAT prep courses and expensive college counselors,” the boy says. “There’s already huge pressure on me to achieve.” Parental hypocrisy and insincerity do not constitute moral guidance. Mr. Weissbourd rightly identifies the praise craze and the achievement obsession as a reflection of parental status anxiety. It seems that the more successful parents are, the more likely they are to worry about their children’s possible failure to live up to that success. One of the author’s most arresting contentions is that the children of immigrants “fare better than their American-born counterparts” in almost every measure of mental and moral health. American-born parents would have a lot to learn from immigrants, Mr. Weissbourd insists. They are comfortable with imposing authority and discipline, and they are optimistic about their children’s future. As a psychologist, Mr. Weissbourd is at his best when he analyzes the all too familiar phenomenon of the overzealous sports parent. In a high-school cafeteria, the author sat in on a meeting between about 30 parents and a sports consultant, who was warning them about becoming over involved. A parent raised his hand and made a confession: “I remember my son’s last day playing youth soccer. The game was over, and I remember standing out on the field and thinking to myself: ‘What am I going to do with my life?’ ” The first step toward moral education for kids, Mr. Weissbourd says, is for parents to separate their own needs from their children’s and to start regarding parenthood as an opportunity for their own moral growth. Good advice. But parental self-awareness is hardly more than a baby step on the path toward producing tomorrow’s productive and caring adults. Mr. Weissbourd identifies some of the more daunting barriers to healthy enculturation — among them the breakdown of the two-parent family and the decay of standards for public and private behavior — but he never really gets beyond superficial solutions to these vexing social problems. Urging pediatricians to encourage fathers to attend their children’s check-ups, or suggesting that ministers “ask noncustodial fathers how many times they have seen their child in the last month,” is unlikely to convert legions of estranged fathers into engaged parents. The methodology employed in “The Parents We Mean to Be” similarly does not inspire confidence. We hear about Mr. Weissbourd’s interviews and surveys, but the book offers few quantitative results or analyses. Much of the evidence of parental incompetence is anecdotal — even, as with the story of ball-hogging Chris and his stepfather, based on people that Mr. Weissbourd happened to run into. His stories will no doubt resonate with many readers — who among us has not encountered an oppressively sports-minded father or an Ivy League-obsessed mother? — but such vignettes do not add up to a firm sociological thesis. Mr. Weissbourd also tends to gloss over the institutional failures that have driven many parents to passionate advocacy for their children: the failure of public schools, for example, to uphold high academic and behavioral standards. The influence of the media and celebrity culture on children’s mores and material expectations is also far more profound than Mr. Weissbourd would admit. And just who is ultimately responsible for the excesses of the self-esteem craze — parents or the psychologists and educators whose books parents read for advice? Ms. Skenazy gained a certain national notoriety after she wrote a column about allowing her 9-year-old son to ride the New York City subways by himself. Even parents fed up with our child-coddling culture might blanch at the thought of turning a third-grader loose on public transportation. But Ms. Skenazy will find plenty of supporters for her contention that, in a world where the rights of chickens to roam freely are championed, it’s time to liberate the kids. This article appeared in the Wall Street Journal. Ms. Mack is the author of “The Assault on Parenthood” (Encounter).